Beast Meridian, poetry. Noemi Press, Akrilica Series, 2017. Narrated by a speaker in mourning marked as an at-risk juvenile, Beast Meridian follows a first-generation Mexican-American girl in crisis surviving the painful experiences of a racialized girlhood, cultural displacement, generational trauma, familial loss, economic struggle, and violence. In turn, this collection radically dreams and imagines a surreal state in which these damages may be recovered, and in which the fragmented self may be remembered and re-membered. Literary Hub, "Our Favorite Poetry Collections of 2017"
Bustle, "15 Protest Poets You Should Be Reading During National Poetry Month" and "21 Poems By Queer Poets To Read This Pride Month"
Beast Meridian is a fierce incantation, harnessing the intuition and intelligence of personae navigating a "melancholy galaxy" full of the violences of societies and families, in which the pain of the earth and the pain of the body are not separate. In languages of tenderness and weaponry, landscapes and bodyscapes, insight and foresight, talismanic memories and imaginings, Vanessa Angelica Villareal constructs layered complications to see newly into, or grieve not being able to look beyond. Far from surrender, the poems write toward a communal resilience: "entre todas las mujeres we kneel to push away the final night"—a unity among wounded women, their collective mythology infused with necessary interrogations and radiant intensity, as they (and their words) "spill & spill until we spread / like a flood." 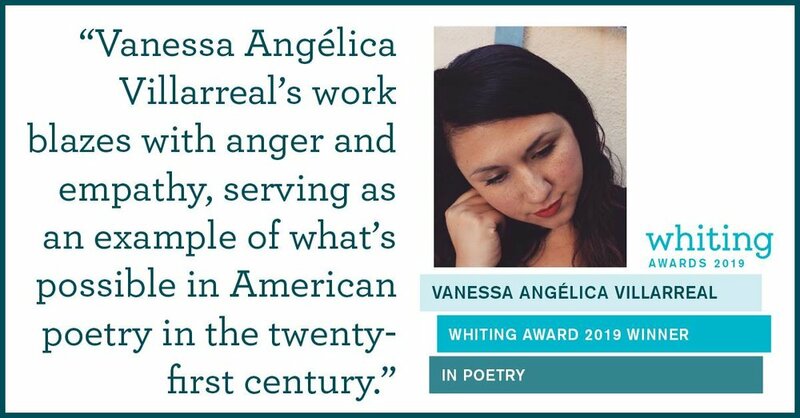 Vanessa Villareal’s poems are alive, haired, precise and strange with ardor, with loss, with a remembering (live and lit!) born out of the crossroads of elegy and desire. With these poems I feel I have the rare and gorgeous chance to experience a formal invention built out of urgency, and with such intimacy. Here there is a diction, a music, knived and lucid. A body, or bodies, shapeshifting across pages, possessed and dispossessing, dying-birthing-getting born, simultaneously “I” and “we”: “your black cervix my first egg drop & / so we hatched myself—“. There is such a brilliance everywhere here.